A Cardboard Problem: Who is Matt Moore? With all the craziness that led to the end of the baseball season, one more thing got fans scratching their heads. The Tampa Bay Rays named Matt Moore their Game 1 starter for the American League Division Series. Don't feel bad if you don't know who he is. It doesn't make you any less of a baseball fan. Matt Moore has pitched in three Major League baseball games for a grand total of 9 1/3 innings. You can say he hasn't gotten a lot of exposure. Moore is 2007 eighth round draft pick - the same year as David Price. The 22-year-old is a lefty and has made just one career start. On Sept. 22, he went five innings against the New York Yankees, giving up just four hits and striking out 11. Even though Moore just came up to the Majors, he has a number of baseball cards on the market - all prospect and no rookies. The first card to look at for Moore is the 2011 Bowman Platinum Superfractor. Seems that seller picked the right time to list this card. 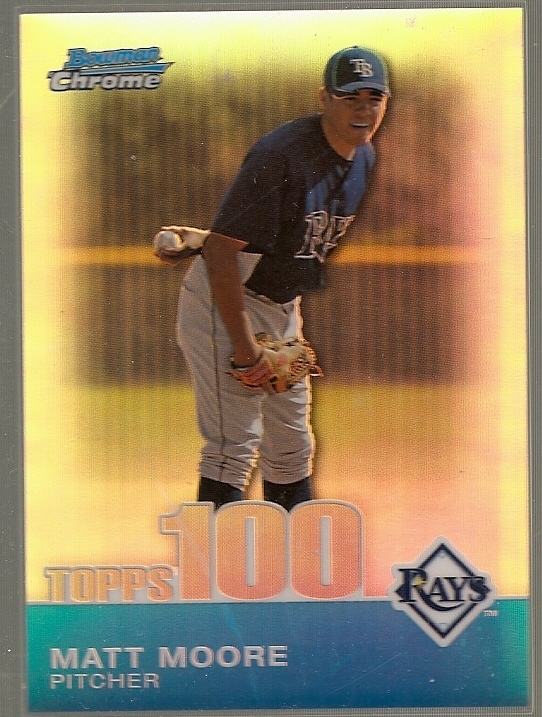 Moore's first Bowman appearance came in 2009. Even these sellers were able to wait until Moore was more popular. Just in case you didn't have enough rare cards on Moore to choose from, the 1/1 parallel from Topps Pro Debut is even out there. And now he is also the winner of game 1 of the ALDS. And his cards are soaring in price, of course. nobody in my area would care for the Rays if it weren't for the local kid Moore.